They say, "teamwork makes the dream work," and it’s true; you can achieve much more when working together than on your own. Many favorite songs have ‘features,' in which one artist hops on another's track. 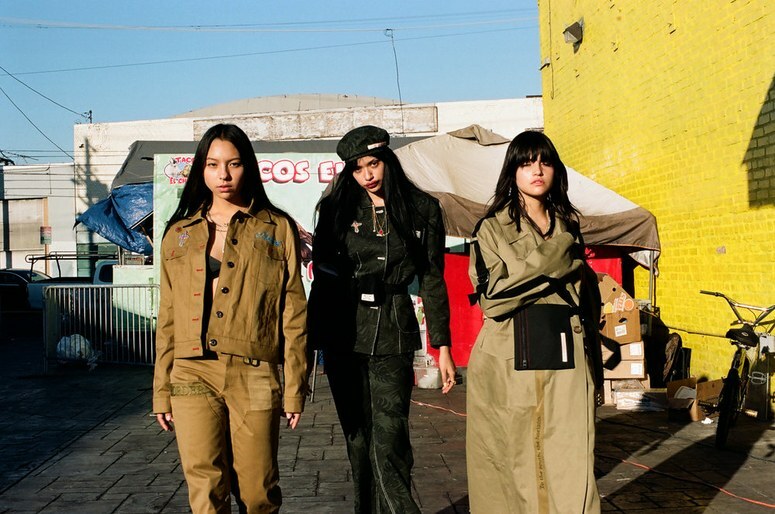 Now, luxury streetwear brands are doing the same thing, dipping in and out of each other’s orbits to create interesting (and sometimes out-there) collaborations. Collabs are a major trend of the streetwear scene, and brands are hungry to jump on board. What attracts these different companies to hop into bed together? Many of the currently popular streetwear collaborations come with an added sheen of exclusivity. This exclusivity gives them the advantage of timing their ‘drops’ for maximum effect and hype. People wait in line to get their hands on highly-coveted items and mob the stores during launch events, all to lay claim on what may become a rare piece of fashion history. These ‘gotta-have-it’ streetwear drops can do wonders for a brand outside of the streetwear sphere. A collaboration with a ‘cool’ streetwear brand, like Supreme or Bape, can raise the cache of a perceived ‘uncool,’ or otherwise unlikely, brand. Some of these collaborations can be unexpectedly awesome, such as The Hundreds’ team-up with Disney back in 2008. Meanwhile, others can be downright off-the-wall in their novelty, or even perceived as funny. For example, when Supreme mashed up their band with the burger chain White Castle (and then again with Budweiser). Weird or wonderful, the fruits of these combinations are rarely ever uninteresting. The additional brand cache brought by a collaboration ultimately translates to real cash. Champion, the ubiquitous sportswear brand of the late 80s and early 90s, began collaborating with streetwear brands in 2010. They first teamed up with Supreme, and have since gone on to work with Off-White, Bape, and Vetements on wildly popular capsule collections. This strategic partnering has paid off royally. Champion’s revenue increased by 15% in a single quarter in 2018. Of course, streetwear brand collaborations don’t only take place between fashion houses. Two brands of different industries can come together to produce a collection, such as the previously mentioned Supreme/White Castle tag team. Some clothing brands even team up with an artist for a fashion line, as OtherLinks does with up-and-coming street artists. The possibilities are truly endless - as is this list of our favorite streetwear collaborations. After sending Supreme a cease and desist letter back in 2000 for unauthorized use of their logo, Louis Vuitton happily walked down the runway with the preeminent name in streetwear in 2017. Dickies Japan used caricatures from the late, great Keith Haring on some of the essential pieces from their Black Line of apparel. This collaboration resulted in a simple (and simply fantastic) capsule, proving that great things that can happen when you mix media. Standout piece? The clean, crisp, polo-neck sweater. When the creative director of Off-White, Virgil Abloh, announced the company’s partnership with Nike for ‘The Ten,’ it was a much-hyped collaboration. In this mash-up, Abloh and Co. reimagined Nike’s most iconic shoes. The results pretty much speak for themselves - and are still highly coveted even a year after their release. This collaboration is one that had many initially thinking "wait, what?" But then, after you saw it, you just had to get with it. When they first announced this pairing, there was some mild skepticism. However, after the initial collections’ wild success, Richardson and those rascals at Pornhub have now introduced their second clothing collab, with more collections surely to follow. For his 2012 collab with Timberland, American designer Mark McNairy took the chance to redesign the company’s iconic boots, with some extra colors and textures to create a great effect. While Kith has lent youthful energy to established brands in many collaborations, the Kith x Moncler collection stands out as the perfect marriage. Classic & iconic pieces from both company’s catalogs were reimagined and presented in red, white, and blue to pay homage to their countries of origin, the USA and France. What can we say? OVO knows how to work with a subject, and Timberland provides a great canvas on which a streetwear designer can express their brand. The OVO x Timberland capsule from November 2018 focused on Timberland’s classic, 6-inch boot, and the World Hiker Country Boot, both in understated reworks. Long associated with basic pursuits like "all pumpkin spice EVERYTHING," perennially comfy-core Ugg Boots are setting the stage for an Uggs Renaissance. The brand is teaming up with A Bathing Ape for a run of winter footwear that’s heavy on the Australian boot brand’s shearling leather style. Vetements will always be among the greatest of all time for making luxury fashion and streetwear mashups the fashion force they are today. Their capsule collection with Champion was a critical darling of streetwear fans and industry watchers alike. The collection included reimagined sweaters, sweatpants, and hoodies embellished with the classic Champion logo. The low-profile, but no less iconic, Mastermind JAPAN joined forces with the ubiquitous streetwear marque Anti Social Social Club in February 2018 for a run of hoodies and bombers jackets. The designs kept the mystique of Mastermind JAPAN while blowing it up to enormous proportions with ASSC’s huge levels of hype. By the time you have read this, ten more luxury streetwear collabs have likely launched in pop-up shops all over the world. Thanks to constant new collaborations, we are going to have to update this list virtually as soon as we post it. Luckily for us, that's more incredible team-ups for us to admire and cop when they drop.